Each day, companies generate around 92,000 pieces of new content(1) for online consumption. They all share the same goal: being read by as many people as possible. This is because, typically, inbound marketing pours 57 percent more leads into the marketing funnel than traditional marketing does(2). A lead may result in a small impulse buy, or it may spark a discussion about a larger purchase. Whatever the purchase or “conversion” point may be, the tactics are often the same: a strategy to create content, strategies to help an audience find that content, and strategies to optimize it for conversion—and voilà! A conversion. However, not all content types work for all audiences. For example, the content strategy for a B2B could be to create content that requires a considered decision, whereas content for a B2C may be to stimulate an impulse buy. In this case, the B2B content should focus on establishing an authoritative profile for that business and providing more educational resources (quadrant 1). 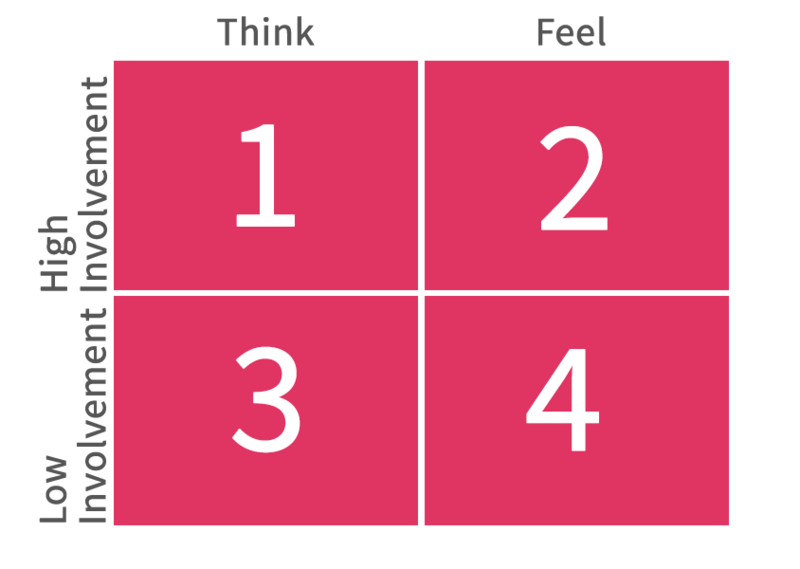 B2C content, on the other hand, should target users with emotionally (quadrant 4). This was put best by Richard Vaughn and his FCB grid(3). 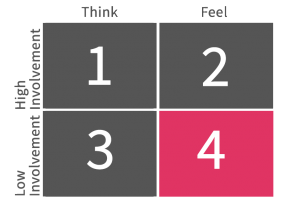 When creating content for quadrant 1, focus on delivering information. This quadrant requires a lot of thinking by your audience, because the decision made today could affect the rest of their lives. The goal is to generate enough awareness and share enough information that your audience will like you enough to convert. This is because buyers often go 57 percent through the sales process before making a purchase or converting(4). Gathering the most recent facts, figures and statistics on your industry and sharing them on your site will allow your audience to learn enough about the topic/product to feel comfortable talking about it. People don’t want to feel foolish; often, what holds them back from making a purchase is a lack of information. One long mega-list with tips, tactics, statistics and answers is easy to skim, and enables readers to know and understand the product better. And where did the reader find this content? Your site. 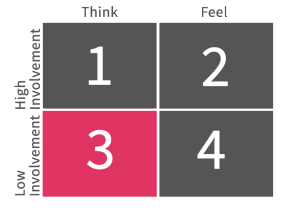 Content for quadrant 2 should spark emotion in your audience. The content should make your audience feel that your topic/product will help them be more. It may boost their ego or build their self-esteem. If this is what your audience is looking for, they will look deeper to learn more about the product. Videos allow you to easily communicate your message and trigger emotional responses. For example, One A Day Vitamins commercials usually portray active adults outdoors, effectively conveying the message that taking One A Day will enable you to do this too. Clothing companies feature beautiful people dressed in their clothes having a great time. You could also make use of remarketing and follow these visitors by advertising your product on 3rd party sites or when users are making purchases on your shopping cart. 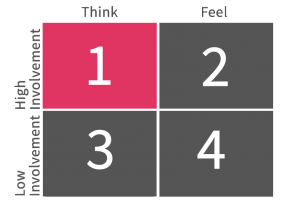 In this quadrant, content should relate to your audience’s personal satisfaction, marketing products that require low involvement and targeting your audience’s feelings. Typically, this content will communicate the way a product will make someone feel. How do I measure the performance of content? To measure the performance of content on your site, first define a clear goal for each content piece. The goal may be to drive traffic, boost engagement, or reach a defined audience. If the goal of the content is to drive traffic, use metrics like page views, users, and sessions. If the goal of the content is to drive strong engagement, look at conversions or social actions taken with that content piece. 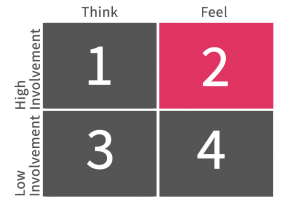 Identifying relevant baseline metrics is key to accurately measuring the success of content. Start by reviewing content that has been produced during the last six months. If the content created during that time frame was purely to drive traffic, look at which pieces were the most and least succesful at generating traffic. This will give you a baseline for performance. If your aim is to produce high-performing content, you’ll have a benchmark for success. Take a moment and think about your business and your audience. Which quadrant are you in? Then do a quick audit of your website to see if you have all or any of these types of content. Only 32 percent of marketers say they are successfully operating a content marketing plan(5). If you need help with creating a content strategy, Gravitate can help. If you found this article useful, please share it. If you have any questions or points you’d like to add, feel free to leave a comment.